Earlier this week, Mr. Limestone had brought home a little present for me. 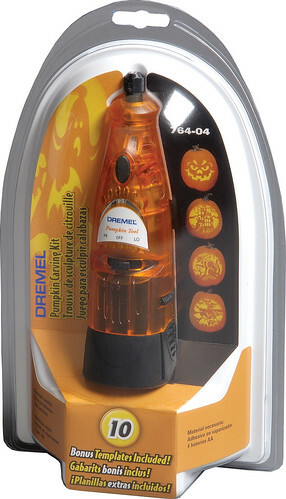 A pumkin carving cordless dremel! Isn't he sweet? We do own a standard dremel but I've never had any luck with it. Its too powerful for me to control and I end up making a mess of whatever I touch. So I'm hopeful this baby version is going to more my speed. Its a little too early to cut into the flesh of a pumpkin just yet but I'm eager to break this bad boy out and see what it can do! With that in mind, here are some pretty fabulous pumpkins from Martha Stewart, Country Living and the (now long gone) Hallmark magazine. No surprise that I'm crushing on Martha's pumpkins the most. Where does her staff even find gourds those perfectly disturbing shades of green and gray? Oh Martha, you vex me!! Here are a few of the pumpkins I carved in past years. Not up to snuff by magazine standards but I try my best. So tell me: What are you carving this year? That woodgrain painted carving so very lovely! I have a pumpkin project that I'll be working on soon!! We're going to have a pumpkin-carving party in October, about a week before Halloween. I'm just about ready to send out the invitations and very excited to see how it turns out (haven't done this before). I love your creativity, ingenuity, and love for all things fun, beautiful, and fabulous! And you do it all with no hint of condescension. In fact, I LOVE your frugle approach to decorating and entertaining. Thank you so much for sharing your creative spirit with the world! I feel so lucky to have discovered your blog! I adore those fabulous white pumpkins with black painted spiders and webs, how unique! Ummmm I think your pumpkins are pretty fabulous too!! I may have to get that dremel... I am dying to have one of those lacy looking ones from Martha! I love all of those carvings. I typically resort to painting the pumpkins and calling it a day. Wow, you are very talented! I may need to get that tool this year and do something cooler than my boring face carvings. You have inspired me! You crack me up...you are so not playing when you have power tools for carving pumpkins! LOVE IT!!! Show us what you do with it! that cinderella's coach pumpkin with those teeny mice is KILLING ME!! and your pumpkins are awesome! must have that dremmelthing. we care many many pumpkins around here, so my hands thank you. Those are some crazy great pumpkins...I just may have to put a bit more effort into the craving this year! Your pumpkins are great! I’m very eager to start carving as well; I’ve been looking to Martha for some ideas too. And you’re right…where is that pumpkin patch full of perfect colored and shaped pumpkins Martha? We need to know! I've bought colored pumpkins at Whole Foods, Henry's and Spouts, they are sooo cute. Also, a pumpkin patch had them the last couple of years as well. I can't wait to get my pumpkins! The patches open next weekend (tooo hot here still! ugh.) I love your displays. I can't wait to see what you come up with now that you have a new toy. Mr. Limestone is a sweetie in buying a dremel for you. Wow, just WOW! I hate Halloween but maybe if I could carve pumpkins like these I might reconsider. I think that your versions look awesome too. Where did the dremel come from? I'd like to purchase one. Where did the pumpkin dremel come from , that wouls be a great tool to have . I am stamping those letters in with just a small hammer ,learning as I go . Saw that Dremmel @ Lowes last week! Jealous. I gotta say, I'm muy impressed by your carving skills (even without your new toy!) Can't wait to see what you do this year! Sadly, I haven't carved in a few years, I usually just paint a monogram on 'em. Color me inspired! Saw that Dremmel @ Lowes last week! Jealous. I gotta say, I'm muy impressed with your carving skills (even with out your new toy!) Sadly, I haven't carved in a few years and usually just paint a monogram on 'em. Color me inspired! LOVE pumpkins during fall! I just got some miniature ones just for decor, and they're so cute. That Dremmel thingy looks fantastic! I really like the mouse house pumpkin from the Martha website (sawing little holes in a pumpkin and putting mice in the holes). Cannot wait to see what you do! And how you deck out your house...LOVED it last year! I love you Halloween posts! They get me so excited! these are some amazing pumpkins, great photos! I'm so jealous! I want my husband to come home with a pumpkin carving dremel! :) I may just have to go get my own. I've been using those cheap little kits, going through one a year or so to do the 4-6 pumpkins I feel I MUST do for Halloween. It's a sad compulsion, but I haven't extended it to decking out my home (as you do so well!). I'm getting close though, let me get through the kitchen remodel and we'll see. Wow, I am SO not going to post pics of my pumpkins this year. They're incredibly lame compared to Martha's AND yours! What a wonderful husband you have- thats such a great present. I cant wait to get out my drill and special bits that my Dad got me just for "carving" my pumpkin!